Russian sturgeon (Acipenser gueldenstaedtii) is commercially important in Korea because its caviar is highly prized. Although the early ontogeny of the species has been described, behavioral modifications in response to various light intensities or diel photoperiodicity patterns have not been studied extensively. The objective of the present study was to examine the behavioral characteristics of hatchery-produced A. gueldenstaedtii prelarvae over a diel photoperiodic cycle. During a diel light cycle comprising 16 h of daylight (450 lx), 4 h of dim light (10 lx), and 4 h of darkness (< 1 lx), newly hatched A. gueldenstaedtii prelarvae exhibited negative phototaxis in daylight (day 0–day 2), and this early behavior was not significantly affected by changes of light intensities. Rheotactic and non-rheotactic aggregation into schools was typical between days 3 and 6. 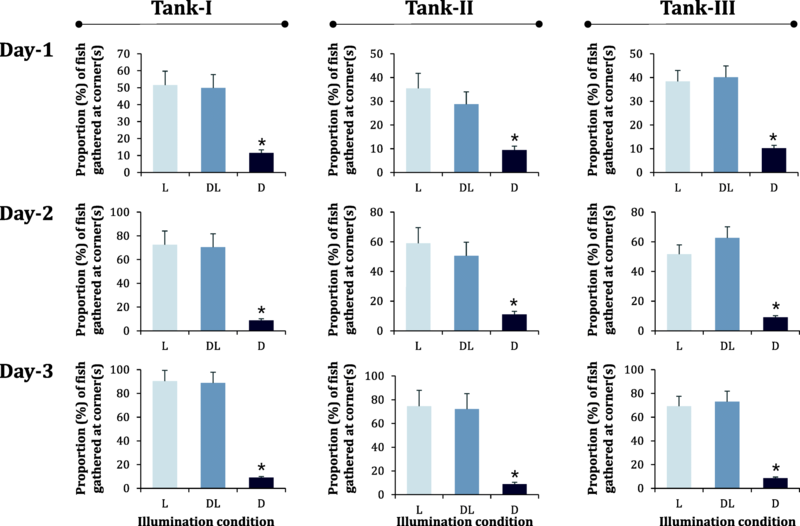 Under the diel light cycle conditions described, rheotaxis was not influenced by environmental light intensity as much as non-rheotactic schooling behavior. Post-schooling behavior, which progressed from day 7 to day 8, did not change significantly during the diel light cycle. The data from the present study could be of practical value in developing a visual guide for assessing the fitness and quality of Russian sturgeon prelarvae under diel light cycle conditions in hatcheries. Sturgeon, which are extant primitive fish of the order Acipenseriformes, are highly valued as a source of caviar (LeBreton et al. 2006). However, because almost all wild sturgeon populations are threatened or endangered, the artificial propagation of sturgeon has become important for the sustainable production of caviar and for restocking natural populations (Doukakis et al. 2012; Johnson and Iyengar 2015). Light is a critical factor that influences the behavior and other physiological characteristics of sturgeons, especially during their prelarval and larval stages (Dettlaff et al. 1993; Loew and Sillman 1998; Chebanov and Galich 2011; Zaheh et al. 2013). Light-dependent behavior in sturgeon prelarvae is established as early as the mass hatching stage (Dettlaff et al. 1993), but this innate trait differs considerably among Acipenser species. During early life, sturgeons exhibit positive, negative, or no phototactic characteristics depending on species-specific adaptation to the natural habitat (Chebanov and Galich 2011; Zhuang et al. 2002; Gisbert and Ruban 2003; Williot et al. 2009). In the context of aquaculture, species-specific light-dependent behaviors are important for enabling hatchery managers to define visual criteria for the ontogenetic development of prelarvae and to explicitly evaluate the fitness and physiological state of the prelarvae. It is therefore helpful to develop optimal illumination regimes for prelarval nurseries of target sturgeon species (Gisbert and Solovyev 2018). Most sturgeon species are characterized by a lengthy period of prelarval development (usually more than 1 week) and undergo dynamic changes to their ontogenetic behavior during that period (Gisbert et al. 1999a; Gisbert and Nam 2018). Usually, hatcheries apply a photoperiod regime during the prelarval rearing period. Therefore, the behavioral characteristics of the sturgeon are potentially influenced by the diel photoperiodicity of the hatchery. The Russian sturgeon (Acipenser gueldenstaedtii) is one of the most commercially important Acipenser species—mainly because its caviar (“Ossetra caviar”) is highly prized—and is now an important candidate species in Korean aquaculture (Kim et al. 2018; Park 2018). The ontogeny and general behavioral patterns of artificially produced Russian sturgeon have been described by several research groups (Dettlaff et al. 1993; Chebanov and Galich 2011; Kynard et al. 2002). However, previous studies on farm-bred Russian sturgeon have mainly described the behavioral patterns observed during daylight hours only (Chebanov and Galich 2011; Kynard et al. 2002). In contrast to the relative abundance of information on daylight behavior, behavioral modification patterns in response to various light intensities, or during a diel photoperiodic cycle, have not been extensively explored. Such a paucity limits the visual criteria-based evaluation of prelarval ontogeny to daylight hours, and may also hinder a full comprehension of the diel patterns of the activities and behaviors in hatcheries. Therefore, the objective of the present study was to examine the behavioral characteristics of hatchery-produced Russian sturgeon prelarvae during a diel photoperiodic cycle consisting of three different light intensity conditions (i.e., daylight, dim light, and darkness). We obtained the Russian sturgeon (Acipenser gueldenstaedtii) used in the present study from Dinoville Sturgeon Aquafarm, Hamyang, Kyoung-nam, Republic of Korea. We injected luteinizing hormone-releasing hormone analog (LHRH-a; Sigma-Aldrich, St. Louis, MO, USA) into the muscles of mature female (n = 2) and male (n = 3) broodfish at dose levels of 80 μg/kg for females and 20 μg/kg for males to obtain eggs and milt (Kim et al. 2018; Park 2018). We used the wet method for artificial fertilization and treated the fertilized eggs with anti-adhesive agent (Fuller’s earth; Sigma-Aldrich), as described by Kim et al. (Kim et al. 2018). We maintained the water temperature of the hatching incubator at 20 ± 0.5 °C until hatching commenced using thermostat-assisted submergible aquarium heaters (300 W). We estimated the fertilization rate in three random samples each consisting of 120 embryos at 2 h post-fertilization (HPF). We estimated hatching success and the incidence of abnormality in 240 embryos and 360 hatchlings, respectively. We transferred newly hatched prelarvae (n = 4500) collected within 4-h intervals to one of three replicate tanks (width × depth × height = 1.2 m × 2 m × 0.25 m), each containing approximately 300 L of 1-μm filtered groundwater. Each replicate tank was equipped with a custom-designed filter unit (200 L volume) and water was re-circulated through the filter unit at a flow rate of 8 L/min using a submersible circulation pump. Throughout the experiment, we maintained the water temperature at 20 ± 0.5 °C using automatic thermostat-assisted heaters and the dissolved oxygen content at 8.0 ± 0.5 ppm using air diffusers connected to an electric air pump. The pH of the in-tank water ranged from 7.2 to 7.4 during the experiment. We immediately removed and counted dead or apparently malformed individuals. Every day, we sampled 12 prelarvae from each tank replicate (i.e., 36 fish) to determine growth and morphological differentiation. We measured the total length and body weight of each prelarvae to the nearest 0.1 mm and 0.1 mg, respectively. We recorded the morphological development of the prelarvae with an AZ100 microscope (Nikon, Tokyo, Japan) and NIS-Elements basic research image analysis software. We provided the first exogenous feed (100 μm-sized powder for flounder larvae; Woosung Corp., Republic of Korea) on day 9. We reared the prelarvae in an experimental room (located on the first basement floor), which was covered in blinders to exclude external light. To assess the ontogenetic behavior of the sturgeon prelarvae in a diel light cycle, we set a photoperiod cycle in the following order of precedence: light (L) for 16 h, dim light (DL) for 4 h, and darkness (D) for 4 h. The illumination conditions for each interval were as follows: (1) L, the light intensities across the experimental tanks averaged 450 lx supplied by white light-emitting diode (LED) lamps (23 W) enclosed in translucent plastic covers and installed on the ceiling approximately 3 m above the tanks; (2) DL, all the white LED lamps were turned off, and translucent glass-covered incandescent lightbulbs (7 W; 6500 K) provided 10 lx across the experimental tanks; (3) D, an infrared (IR) LED spotlight (10 W; 730 nm) was set to shine toward the wall, which was more than 8 m away from the experimental tanks, and the light intensity was less than 1 lx. We monitored transitions in diel behavioral patterns—including negative geotaxis (also called swimming-up), rheotaxis, schooling, and post-schooling behavior—under the diel light cycle from day 0 to day 9. We examined ontogenetic diel behavior patterns at 1 h before the end of the L-phase, 1 h after the DL-phase, and 1 h after the D-phase. We also made random examinations when we observed typical transitions and/or modifications of behavior. Based on previous reports on the behavioral ontogeny of Acipenser species (Gisbert and Solovyev 2018; Park 2018), we applied seven main criteria to define and evaluate potential modifications to behavioral characteristics of Russian sturgeon during the prelarval period from days 0 to 9. The criteria included negative geotaxis and passive drift, pelagic swimming in the upper water column, benthic swimming, early corner-gathering, rheotactic schooling, non-rheotactic schooling, and post-schooling behavior (Table 1). According to our principal objective to provide hatchery managers with a visual guide for ontogenetic modifications of prelarval behaviors in response to a diel photoperiodicity, the present study essentially included observational data based on prelarval rearing conditions that were similar to those conventionally used in Korean sturgeon hatcheries. For this reason, the statistical evaluation of behavioral patterns with accurate counting of prelarvae belonging to a particular behavioral criterion might not be relevant in all aspects of analysis. Therefore, we only obtained numerical data addressing behavioral patterns and/or responses at several detection time-points. All observers had experience of at least three other sturgeon-breeding experiments from the preceding 5 years. Evaluation of prelarval behavior was carried out by two observers per replicate tank, and the observers were randomly assigned to each replicate tank for every observation time. Under L and DL conditions, each observer took at least six snapshots and taped a movie video using a digital camera equipped with an iPhone (version later than 7; Apple Inc., USA). Each observation lasted 15 min. We analyzed the selected photographs and videos using Photoshop (Adobe Inc., USA). However, we recorded behavioral patterns under D conditions using an IR light illuminator (850 nm; Fenix, USA) and/or an IR night vision camera (Ancter, USA). We carried out quantitative assessments on day 0 on a small number of newly hatched prelarvae (n = 120/tank) assigned to three small rectangular tanks (30 cm × 60 cm × 25 cm) with white bottoms. We counted the numbers of prelarvae at least six times for each replicate tank. During day 1 to day 3, we determined the proportion of early corner-gathering prelarvae in the rearing tanks. Some early prelarvae gathered at a corner of each tank, and we trapped those prelarvae inside acryl bar-framed 500-μm mesh screens (50 cm × 50 cm square). The observers counted the number of prelarvae inside or outside the square area at least three times and took pictures to determine the percentage of early corner-gathering prelarvae out of the total number of fishes per tank. When the schools formed at the corners and/or water-inlet sites (days 3 to 5), we calculated the number of prelarvae participating in schooling in each replicate tank using an acryl bar-framed screen identical to that described above. On day 8, we installed three square frames (30 cm × 30 cm) in each replicate tank to estimate the proportion of prelarvae exhibiting typical post-schooling behavior inside the frame. We obtained approximately 110,000 fertilized eggs. The fertilization rate averaged 95 ± 2%. The mean hatching successes (%) and incidence of abnormality (%) were 77 ± 9% and 2.1 ± 0.8%, respectively. There was no significant mortality during the prelarval period up to and including day 9. Prelarval survival averaged 98.4%. The average total length and body weight of the newly hatched larvae at 0 days post-hatch (DPH) were 10.2 ± 0.2 mm and 14.5 ± 0.7 mg, respectively. During the prelarval period up to 10 DPH, the average total lengths and weights increased to 20.5 ± 0.4 mm and 40.5 ± 2.5 mg, respectively (Additional file 1: Figure S1). The Russian sturgeon prelarvae had an external morphology that is typical of Acipenser species, characterized by a pair of pronounced pronephric wings, an oval-shaped yolk, and a yolk plug. We observed the beginning of yolk invagination and initial development of the external gills on day 2. On day 4, well-structured eyes were observable and melanin pigmentation was pronounced, particularly in the craniofacial, posterior body trunk, and caudal regions. The yolk plug had condensed into a spiral vale shape, and swimming structures including various fins had developed by day 4. Almost the entire body had become darkly pigmented and dorsal scute rudiments had begun to appear by day 8 (Additional file 1: Figure S1). The light-dependent behavioral characteristics of A. gueldenstaedtii prelarvae examined in the present study are summarized in Fig. 1. Upon hatching (day 0), only a small portion of the prelarvae exhibited negative geotactic behavior and passive drift under L conditions (less than 5% on average), whereas the majority of the remaining individuals exhibited sedentary behavior (Fig. 2a). The movement distance increased on days 1 and 2. However, the prelarvae preferred to remain near the bottom without any clear signs of pelagic swimming into the upper water column. Under DL conditions, the newly hatched prelarvae exhibited no significant behavioral alterations compared to those under L conditions (Fig. 2b). When the prelarvae were exposed to further reduced light intensity (i.e., D conditions), negative geotaxis almost disappeared and the prelarvae moved across the bottom and walls of the tank (Fig. 2c). Bottom-swimming behavior was more rapid under D conditions than under L/DL conditions. We noticed that small numbers of prelarvae began to gather at the tank corners from day 0 under L conditions (Additional file 2: Figure S2), and the number of corner-gathering prelarvae gradually increased with age. Early corner-gathering behavior was not significantly modified under DL conditions compared to L conditions. However, such behavior was much reduced under D conditions (Fig. 3; Additional file 3: Figure S3). Under L conditions, onset patterns of rheotactic schooling (at the water inlet in the tank with a water current of 8 L/min) and post-rheotaxis schooling (at the corners of the tank without significant water current) differed depending on the replicate tanks. In one of the three replicate tanks (tank I), the number of early corner-gathering prelarvae (first seen on day 0) continuously and progressively increased with age and the prelarvae formed large non-rheotactic schools directly at the corners on day 3. The schools at the corners became more robust by day 4, and the size of the non-rheotactic schools—comprising almost all the prelarvae in the tank—peaked on day 5 (Fig. 4). In that tank, we did not observe significant rheotactic schooling behavior until the late phase of day 5. On day 6, considerable numbers (approximately one third) of the prelarvae that had participated in non-rheotactic schools moved to the region around the water inlet and formed a rheotactic school. The co-existence of both rheotactic and non-rheotactic schools continued until the commencement of post-schooling behavior. The pattern of school formation was different from that described above in the other two replicate tanks (tank II and tank III). Although the prelarvae in these tanks also exhibited early corner-gathering behavior—which began on day 0 and increased until day 3—most of the prelarvae at the corners moved to the regions around the water inlets on day 4 and formed large rheotactic schools. Soon after, rheotactic schooling reached a peak, and the majority of individuals belonged to these schools. On day 5, non-rheotactic schools formed at the corners. However, there were fewer individuals in the non-rheotactic schools than in the rheotactic schools (Fig. 4). Under DL conditions, schooling patterns were not dissimilar from those under L conditions. Considerable numbers of rheotactic prelarvae remained in schools under D conditions, although the participating numbers were reduced relative to those observed during the DL or L intervals. However, unlike the rheotactic schools, the non-rheotactic schools were unstable during the D phase. In all the three replicate tanks, the non-rheotactic schools were either significantly reduced in size or almost completely dispersed under D conditions. The prelarvae besides those in the non-rheotactic schools exhibited benthic behavior across the bottom of the tank (Fig. 5). The compact schooling behavior of both rheotactic and non-rheotactic schools began to diminish, with some prelarvae exhibiting post-schooling behavior (from the early phase of day 7). The number of prelarvae exhibiting post-schooling behavior increased continuously during the DL and D phases (days 7 to 8) (Fig. 6). The majority of prelarvae exhibited post-schooling behavior (i.e., non-locomotory, scattering over the tank bottom) on day 8 (Additional file 4: Figure S4). The larvae began to resume their locomotory activity and moved slowly across the tank bottom after their first feed (day 9). The scores for fertilization, hatching, abnormality, viability, and prelarval growth determined in the present study were comparable to those reported by other researchers studying the artificial propagation of A. gueldenstaedtii (Chebanov and Galich 2011; Nathanailides et al. 2002; Memiş et al. 2009). The development patterns observed in the present study also broadly corroborated those previously described (Dettlaff et al. 1993; Chebanov and Galich 2011), although the speed of development did not exactly match previous descriptions. This was probably due to the difference in incubation temperature (20 °C in the present study versus 16–18 °C in previous studies). Compared to other related sturgeon species, Russian sturgeon belong to the sturgeon group showing the darkest pigmentation during the prelarval period. In the context of hatcheries, the body coloration pattern could be considered a criterion for the evaluation of the developmental or physiological state of prelarvae, as evidenced by previous findings that certain waterborne pollutant (e.g., phenol) markedly inhibit prelarval pigmentation (Dettlaff et al. 1993). The findings from the present study indicate that newly hatched Russian sturgeon prelarvae do not exhibit positive phototaxis, based on their preference for the bottom of the tank under L conditions. No significant negative geotaxis was reported in the hatchling of other sturgeon species (e.g., Acipenser transmontanus and A. brevirostrum) exhibiting negative phototactic characteristics (Loew and Sillman 1998; Richmond and Kynard 1995). Negative geotactic behavior has been considered as a characteristic strategy of the prelarvae of many sturgeon species for early dispersal and predator avoidance. However, this movement is also related to phototaxis (Dettlaff et al. 1993; Gisbert and Solovyev 2018). The prelarvae of several sturgeon species that exhibit positive phototaxis (particularly exemplified by the Siberian sturgeon Acipenser baerii) are reported to actively swim toward the water surface, driven by their intrinsic tendency to approach the light during daylight hours (Gisbert et al. 1999a), which was not clearly seen in the prelarvae of the Russian sturgeon. Under DL conditions, the behavior of the Russian sturgeon at this earliest stage of development was similar to that under L conditions. Although the behavior of the Russian sturgeon prelarvae under D conditions differed quantitatively from that under brighter illumination, a fundamental transition or change in behavior was not obvious. This differed from the findings reported for other positively phototactic sturgeon species that exhibit a dramatic change in swimming behavior during the transition from day to night. For example, Siberian sturgeon (A. baerii) prelarvae do not swim upwards during darkness, and pelagic swimming at the water surface during the day quickly shifts to benthic movement at night, although the exact light intensity at which this shift occurs has not been reported (Gisbert and Ruban 2003; Gisbert et al. 1999a). Onset appearance and development of rheotactic and non-rheotactic schooling in the Russian sturgeon prelarvae were not uniform among the replicate tanks under L conditions. Increased numbers of prelarvae gathered at the tank corners during the early prelarval period (days 0–3) and were capable of forming large non-rheotactic schools directly at the corners or alternatively became rheotactic during day 4. Unfortunately, we were unable to identify any potential causative biotic factors (e.g., survival and fish size) or abiotic factors (e.g., tank conditions) that were responsible for this non-uniformity. It is therefore clear that further extensive tests are needed to determine whether such different schooling patterns are reproducible under various prelarval rearing conditions (e.g., density, illumination, tank shape). Nevertheless, our findings indicate that early corner-gathering schooling is itself closely related to negative phototactic behavior under L conditions. We also found that such corner-gathering prelarvae moved actively to avoid an artificial spotlight (a 3 W white LED flashlight) (tested on day 1; unpublished observation), which is highly suggestive of negative phototaxis. However, our findings contradict previous results in which the 0–5-day-old prelarvae of Russian sturgeon (a Volga River population of A. gueldenstaedtii) significantly preferred bright illumination (Kynard et al. 2002). Although such inconsistent results require further investigation, Russian sturgeon prelarvae have been reported to exhibit a population-dependent variation in phototaxis: positive phototaxis in the Volga River population and negative phototaxis in the Azov Sea population (Chebanov and Galich 2011; Podushka 2003). Dettlaff et al. (Dettlaff et al. 1993) reported that prelarvae of a subspecies of Russian sturgeon (A. gueldenstaedtii colchicus) may not exhibit any phototaxis during the prelarval stage. Under DL conditions, the Russian sturgeon prelarvae readily maintained rheotactic and non-rheotactic schooling similar to that observed under L conditions (days 4–6). This suggests that Russian sturgeon prelarvae may be able to sense weak light. Accordingly, the reduction of light intensity during DL conditions (10 lx) in the present study may have been insufficient to trigger or elicit any significant modifications in schooling behavior. This finding is different from previous observations made with photopositive sturgeon species (A. baerii), in which active schooling behavior under L conditions disappeared when the environmental light intensity was markedly reduced (Chebanov and Galich 2011; Gisbert et al. 1999a; Rodriguez and Gisbert 2002). Under the present D conditions (< 1 lx), the Russian sturgeon prelarvae exhibited a difference in their ability to maintain rheotactic and post-rheotaxis schooling behavior. Though weakened, the rheotactic schools persisted under dark conditions, whereas the non-rheotactic schools almost disappeared. This observation suggests that Russian sturgeon prelarvae at these stages may use vision as the principal means of determining non-rheotactic schooling behavior, whereas their rheotactic behavior may be governed more by an innately established ontogenetic timetable that is less influenced by environmental light intensity. In the present study, the post-schooling behavior of the Russian sturgeon prelarvae did not differ significantly according to the lighting conditions (L, DL, or D). The post-schooling behavior of the sturgeon prelarvae commenced with a decrease in prelarval activity in the rheotactic and/or non-rheotactic schools, typically in the prelarvae at the outer boundary of the schools. As post-schooling behavior progressed (days 7–9), compact schools were no longer maintained. The prelarvae were only loosely aggregated and eventually became dispersed, non-locomotory, and scattered over the bottom of the tank (Gisbert et al. 1999a). This behavior signals the termination of the prelarval phase; the prelarvae are ready to evacuate the yolk plug and finalize the functional development of various digestive organs to ingest exogenous foods (Babaei et al. 2011; Gisbert et al. 1999b). Therefore, this characteristic behavior reflects the ability of the prelarvae to divert energy to the final preparation for the transition from an endogenous to an exogenous nutrition system (Chebanov and Galich 2011; Gisbert and Williot 1997). In summary, the results from the present study indicate that A. gueldenstaedtii prelarvae essentially exhibit negative phototaxis under L conditions during their earliest life stages, and this behavior is not significantly modified under DL or D conditions. During rheotactic and non-rheotactic schooling behaviors, rheotaxis was less influenced by environmental light intensity than non-rheotactic schooling behavior. Post-schooling behavior was not significantly affected by light intensity (< 1–450 lx) during a diel light cycle. The results of the present study could be used to scrutinize the light-dependent physiology of Russian sturgeon prelarvae and to develop a practical visual guide for assessing the health and quality of hatchery-propagated prelarvae under various illumination intensities and/or diel cycle conditions. The present findings should be used to develop an optimal illumination regime for Russian sturgeon prelarvae under hatchery conditions. The authors wish to thank the technical staff at the Experimental Fish Research Center, Pukyong National University, who provided the raw observational data. EJK analyzed the behavior of the sturgeon and prepared the images. CHP bred the sturgeon and co-evaluated the data. NYK designed the study, evaluated the data, and drafted the manuscript. All authors read and approved the final manuscript. We followed the experimental protocols described in the guidelines provided by the Animal Care and Use Committee of Pukyong National University.